Much as "Slow Food" is a contemporary rubric for "what was once normal," so too was all bread once made without commercial yeast, where nowadays, making something "sourdough" is presented as a kind of achievement. 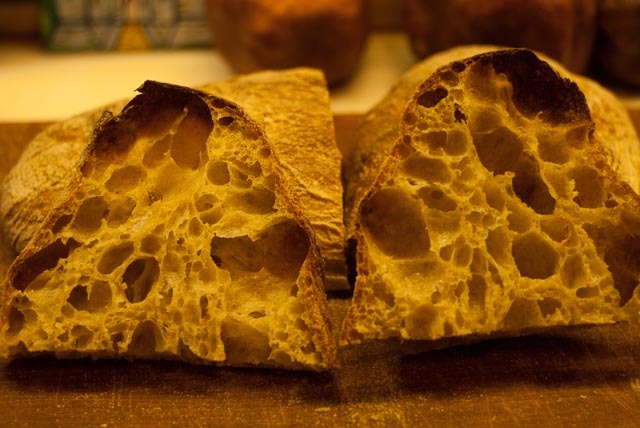 Ciabatta is a bread originally made by poor people, likely first in Liguria. I learned about it just south of there in northern Tuscany, where they pronounce it "shabbatta." It means slipper. The Tuscans have a well earned reputation for being cheap. Their nickname is "mangia fagioli," bean eaters. Before the "discovery" of Tuscany by the British and then everyone else, the undisturbed culture was austere and magnificent at the same time. To save money and resources, Tuscans baked bread without salt (you get used to it) and used more water in order to use less flour. They needed something cheap they could fill up on, like beans. The concept of artisanal sourdough ciabatta with competition quality voids separated by filaments of gluten would be unrecognizable to an old school Tuscan, and preposterous if explained. Among many things, they would want to know how it would hold the oil. I don't bake to live, the way the Tuscans did. Baking for me is a leisure activity allowed to me by a wealthy society, a fun "project." When I do this, I try to remember people I've known who were connected to the old way. Somehow, this gives the outcome more meaning than just saying, "Hey, look at these holes." If there is a purpose to my baking beyond fun and food, it is this learning experience. Being a right brain guy, all I can tell you is that this was about 85% hydration, with long cold hydration for the flour and fermentation for the bulk dough. No question, in all the time I've been reading this site, Pat's comment, "Get the fermentation right." is the most useful and important thing I've learned. Oh, and if you're using that new baking steel idea, try lowering the rack and putting the steam above, otherwise you'll have a pretty tough bottom crust. Delightful post - and you sure got the fermentation right! I was glad to have something worthwhile to share. Appreciate your comment. ciabattta louie but I'm guessing you put some salt it it. Even most Tuscans put salt in their bread today - now that the government hasn't taxed salt for eons and it is dirt cheap even in Tuscany :-) Bread without salt is just plain dead flavor wise in my book and you can't get used to it, even though people say you can get used to anything, unless that is the only bread you have ever had. Hope you escaped the damage from the storm and life gets back to normal soon. 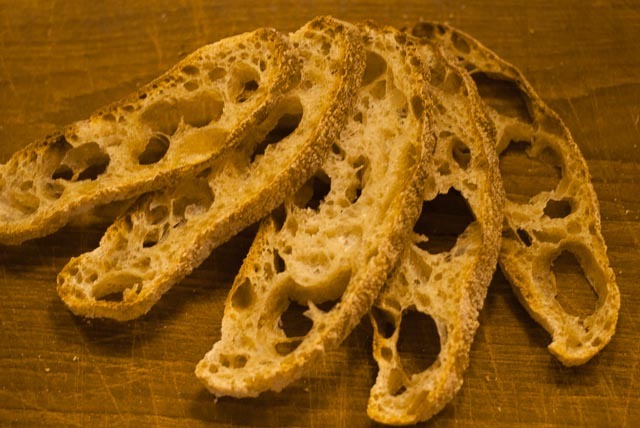 The saltless Tuscan bread and ciabatta are two different things. You're right that almost everyone uses salt these days, but there are still some bakers tucked away who do without. It is definitely not an easily acquired taste. I always use salt. On the few occasions I'vr forgotten it, the bread is pretty sorry. The city is looking at a long recovery from this storm. Our infrastructure is really fragile. We learned two things about water. If you put a roof on something - it will leak and if you build under ground it will fill up with water. Wind, ice and the second law of thermodynamics takes care of the rest. Hope all gets back to near normal soon. That word comes out of my deep past, Pat. Thanks. It's the simple lessons that stick best. Truly great looking ciabatta, louie. The holey crumb is wonderful, of course, but the crust looks really great, too! How long did you cold-autolyse the flour and cold-ferment the dough? It seems like I autolyse the flour a lot these days. For this, it was about ten hours, and then overnight for the dough, about sixteen hours. Between the characteristics of my starter and the environment in my kitchen, it took the formed loaves (if you can call them formed) a little more than two hours on the bench to be ready, which was at a temp of about 76 degrees. I'm glad you liked them. They were delicious, with the springy crumb you'd expect from the process, but without being chewy. I expect that a few tbsp of olive oil would soften the crumb further.